I woke up at 4:45am this morning to head out from Big Sur to Fresno to meet Rockin’ and Why Not, who each were arriving conveniently by train. Why Not lives in the Sacramento area and Rockin’ lives in Tehachapi. Before meeting with them, I had some errands to run and a couple things to mail. This is when I realized what I left in Big Sur…Those of you that have followed me for any time at all know that I have a knack for either losing things or leaving them behind. My mind just thinks about a lot of things at once and that’s when I lose focus. I realized I left a medium sized box full of clothes and resupply stuff I was going to leave in the car. Ugh! At least it was nothing important and it’s being sent to Rockin’s house where I’ll be after the SHR. I will also mention that on my way to Big Sur, I realized I forgot to pack my rain pants and I had to have them overnighted to Rockin’s. I also forgot my new fold up brush, but magically Virginia had the exact kind I use and she wasn’t using it. I’m trying to focus more, but obviously, it’s a work in progress. At this point, with how often I leave things behind, I think it’s good luck if I lose something early on a hike, so this hike should go really well apparently! Still, it’s really annoying to have to waste resources and bug others to send things I leave behind. Sorry and thank you to all involved with the shipping process. So back to our reunion. We met up at the Fresno Train station and got Subway for lunch and to carry in for dinner. 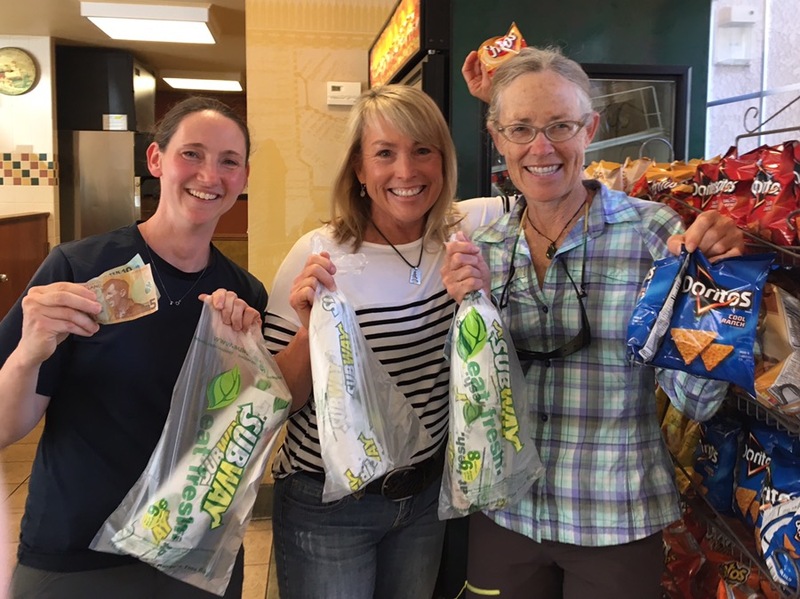 All proper thru hikes really should start with Subway. The drive to the trailhead took about 2.5hrs, and it’s aptly known as Roads End Ranger Station because it is literally at the end of the road. I like the idea of starting a trail/route at Roads End. We had plenty of time and just needed to arrive by 3:30pm to obtain a permit. 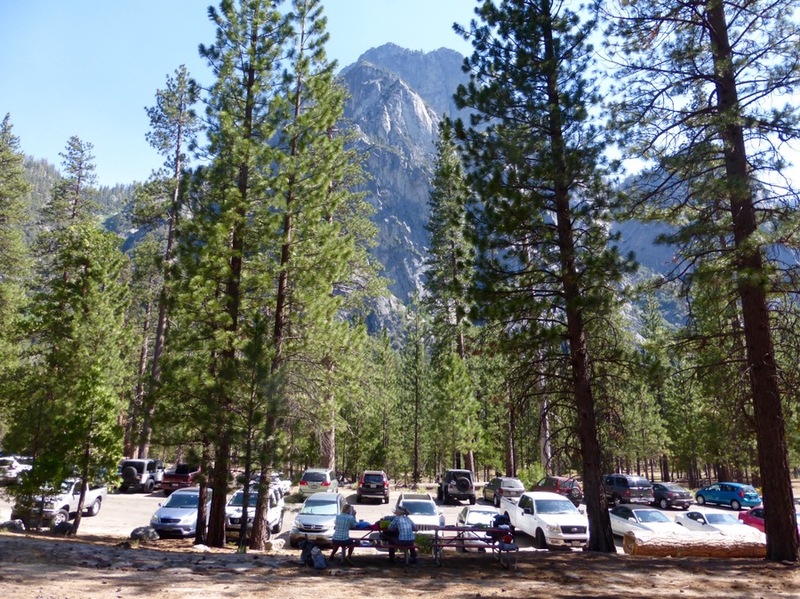 There was a full lot with plenty of tourists and hikers around, which was unexpected for a more remote trailhead on a Tuesday. It was a dry hot 97F when we arrived. 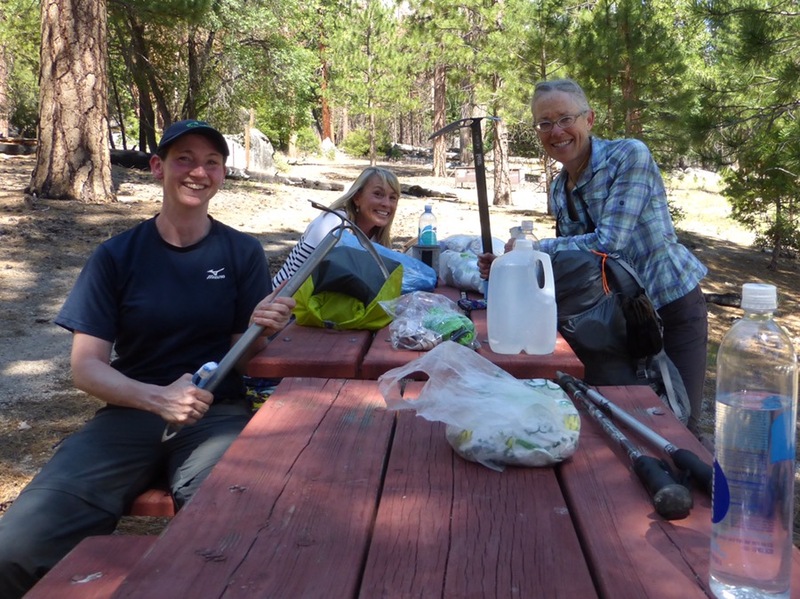 We easily got the permit and decided to lounge at picnic tables next to the trailhead until evening to hike up a bit. Grand Sentinel looming 3,500ft above us across the Canyon. Not knowing how long the drive and permit process would take, we did not schedule any mileage for today. We were all in the mood to hike up a bit and get to higher elevation. Both to acclimate and for cooler temps. We had plenty to do at the tables each giving everything one last check and reading up on the section ahead. Just after 5pm, we decided to start hiking and it was 87F. 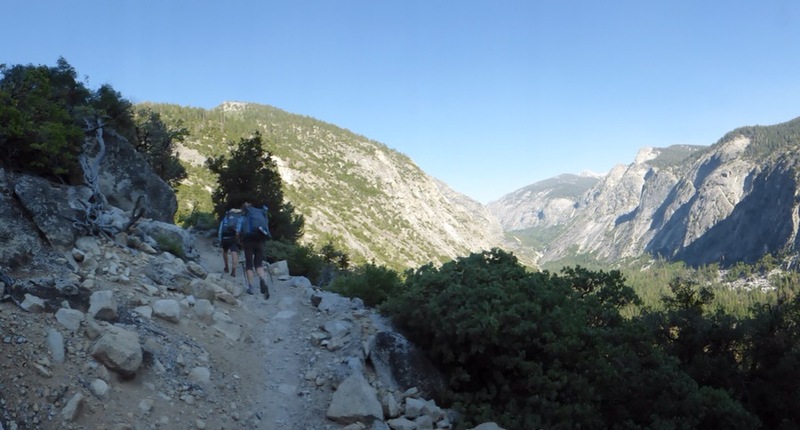 We hiked up the gradual long switchbacks of Cooper Creek Trail starting at 5,036ft. We are in Kings Canyon and the other side of the canyon was visible with the South Fork of the Kings River cutting through it. 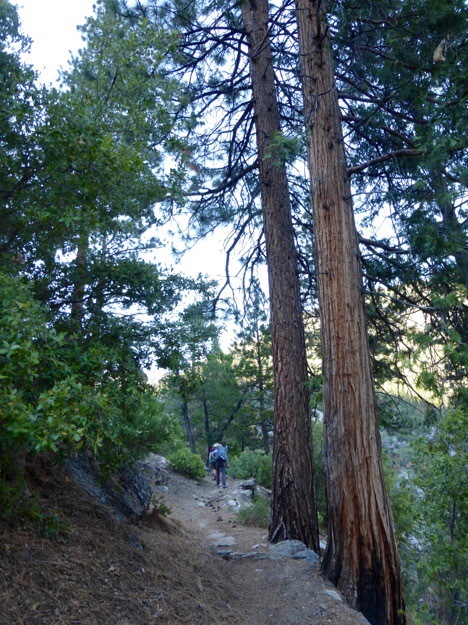 As we got higher, the trees got more dense with a large variety of pine that I really liked. 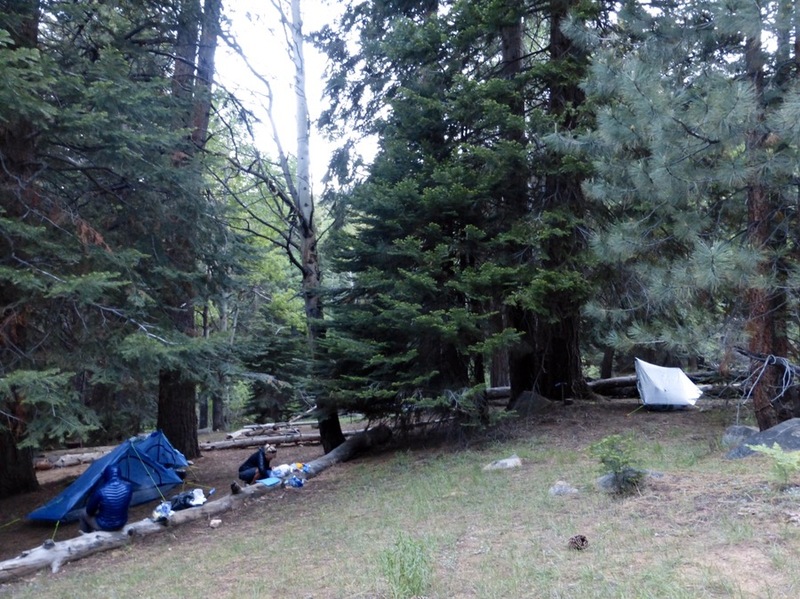 We hiked up about 4mi to a wooded camping area called Lower Tent Meadows at 7,800ft. We all have ZPacks Solplex tents. I’m very happy with the improvements they made. I feel like it pitches more easily somehow and lower to the ground for more protection. I’ve always had trouble with the space and flapping where the front two doors come together and it now has a little toggle to hold them together. The tent also now comes with guy line adjusters, which makes setup great! We all feel remarkably good and I’m thankful that my body is doing ok so far. No spinning or nausea, just heavy legs. I am quite tired though and fell asleep at 10pm well before finishing this journal entry. We are all three just really excited to be out here. We are appreciating dry shoes and aren’t too sure that we will have many days that will end with dry shoes. Weather is awesome tonight in the 50s. Perfect for sleeping. No wonder I couldn’t stay awake to finish this entry! Aside from forgetting stuff, it sounds like your first day went really well! Oh no! That would NOT be ok!! Just noted an Ed Hillary fiver in your hand. Are Subway in the USA now giving change in kiwi dollars? Good eye! I noted that Why Not brought me NZ $$ since she just finished the TeAraroa and I’m headed there this fall. I’m so excited to be reading about your trip! You all look so fresh and eager in these photos. Onward! Of course, I’m following all 3 blogs, so I’ll get to read about it 3 times! YAY!! It is fun to see all the perspectives. I love it when blogs intersect. 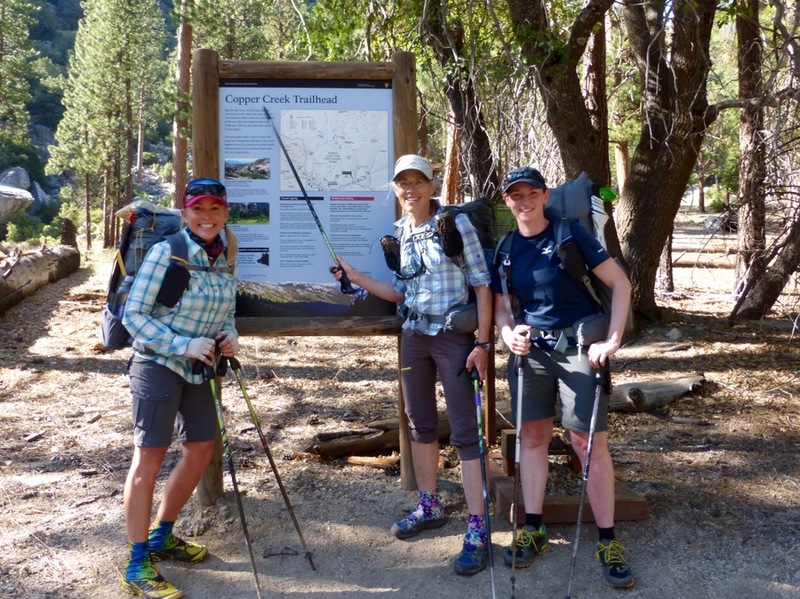 Love, love, love Kings Canyon! Master List + post it reminders on my dashboard = sanity for me! 🙂 Seriously, I even have a ‘permanent’ post it on my daypack to remind me to fill the camelback and pack food.